The cops lobbed teargas shells to disperse the stone pelting mob. Army troops, who were already deployed in the town after the imposition of curfew since Tuesday afternoon, interfered and saved the situation. 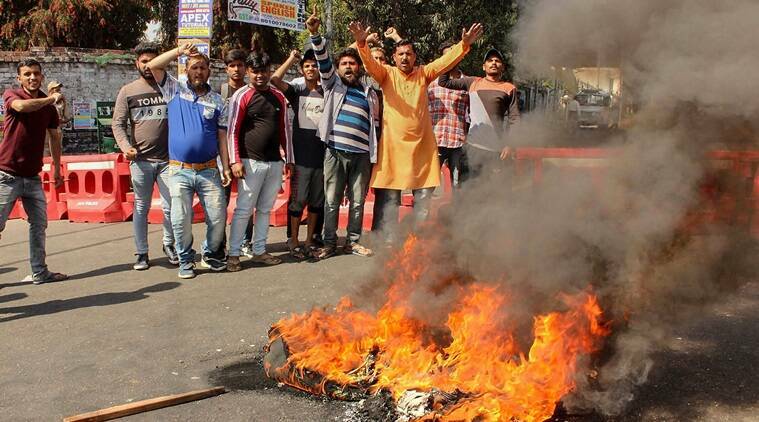 Violence broke out in Kishtwar town on Wednesday as police lobbed teargas shells to disperse an unruly mob, which came on the road in defiance of curfew restrictions to participate in the funeral of senior RSS functionary Chanderkant Sharma. The senior RSS functionary was shot dead along with PSO Rajinder Kumar by militants inside a government-run district hospital, the previous day. Trouble erupted when nearly a 15,000 strong mob, which was accompanying the body of deceased RSS leader towards Chowghan ground for cremation, passed outside the Government Dak Bungalow where senior civil and police officials were standing accompanied by a contingent of police and CRPF personnel. On seeing them, some people in the mob started raising slogans and pelting stones at the police injuring nearly half a dozen cops. The funeral procession finally reached Chowghan ground where Chanderkant Sharma mortal remains were consigned to flames amidst slogans of Bharat Mata Ki Jai. Senior state RSS and BJP functionaries were present to bid adieu to the deceased RSS leader and prominent among them, included RSS prant pracharak Rupesh Kumar, state BJP president Ravinder Raina and Legislative Assembly Speaker Nirmal Singh. After the funeral, a large crowd including women gheraoed the office of Kishtwar SSP Shakti Pathak, breaking the window panes and ransacking the furniture there, sources said. They later dispersed after Pathak assured them early breakthrough into the Tuesday killings at the district hospital, besides intensifying security measures in the town and its outskirts. Kishtwar Deputy Commissioner Angrez Singh said the situation was under control. A few people who ransacked the office of SSP too dispersed after talking with them later, he added. Meanwhile, curfew continued in the Kishtwar and Bhaderwah towns and mobile internet services suspended in entire Chenab Valley for the second day. Police, however, took into custody former minister Choudhary Lal Singh and BJP’s ex-MLA Shakti Parihar along with their supporters when they tried to proceed towards curfew-bound Kishtwar to attend the funeral of RSS leader. Two time MP from Udhampur parliamentary constituency and three-time MLA, Lal Singh, who recently parted ways with BJP to float Dogra Swabhiman Sangathan, was charged for defying section 144 of CrPC in Doda district. Doda SSP Mohammad Shabir Malik said that Singh was taken into custody as he wanted to proceed to curfew-bound Kishtwar with a mob. He was accompanied by people traveling in nearly half a dozen vehicles, he said, adding that no formal FIR has been registered in the matter. While Shakti Parihar and his supporters were released after two hours, Lal Singh was sitting at the Doda police station till evening, refusing to leave the premise until Deputy Commissioner and SSP explained to him as to why he was detained in the morning. Singh, when contacted on phone at Doda police station, criticised the administration for detaining him. This has been done to sabotage his electoral prospectus in Jammu parliamentary constituency which is going to polls on Thursday, he pointed out. Pointing out that the administration and police were working at the behest of the saffron party, he said that the vehicles of BJP and RSS leaders behind him were allowed to proceed to Kishtwar. Everybody is working at the behest of BJP and I do not think that even the officials deployed to keep watch on campaigns of contesting candidates may have informed Election Commission about it, he added.